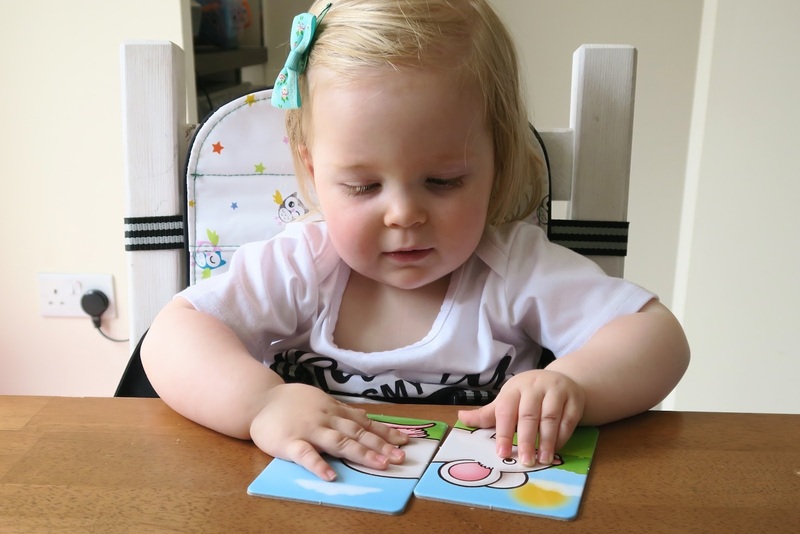 We are constantly looking for new toys that will help Elise learn new skills and keep her entertained. 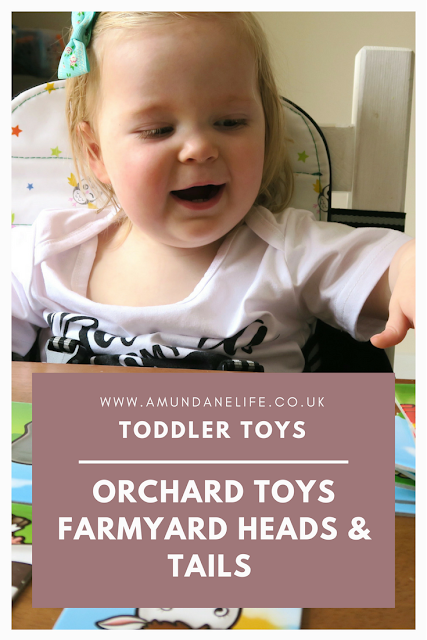 When we came across the huge range of toys and jigsaws that Orchard Toys have to offer, we knew that we had hit the jackpot. Elise gets bored of lots of her toys as they are not challenging, and she loves to learn. That's why the Farmyard Heads & Tails game is perfect for her. Aimed at children 18 months and above, and suitable for 1-4 players, it can involved the whole family. It's even tested by teachers, so you know straight away that the game has some educational value. When we first opened the box, Elise was thrilled. She loves animals, so straight away she started making the noises of the animals she could see. We couldn't get the cards out quick enough! We noticed that there is a wide range of animals that you would see in a farmyard, including a pig, duck, sheep and horse. Of course there is also a tractor and a farmer (who Elise still thinks is a train driver!). 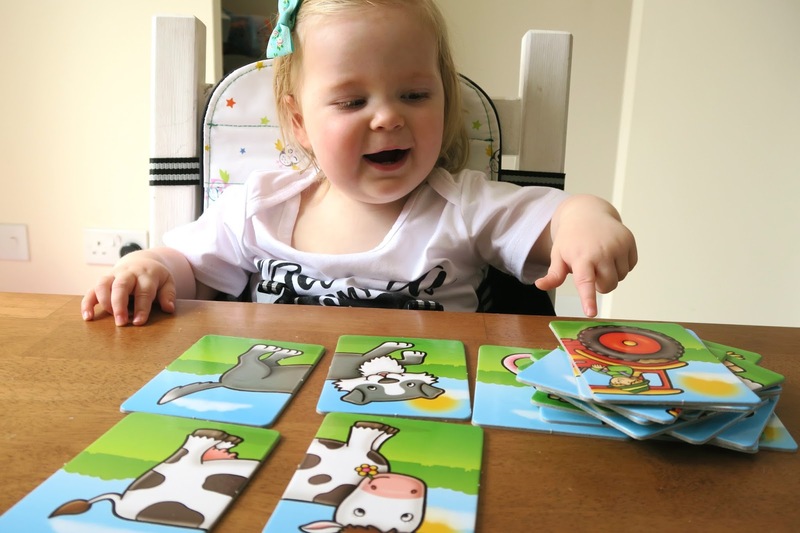 We weren't sure if Elise would be able to match the animals up straight away, and the first time we played she didn't really want to pair them up. She preferred to stack them and make the noises of the animal. As a parent, we were impressed with the size of the cards. We were expecting them to be a lot smaller, but these are large and easy for Elise to hold. They are also nice and thick, so it means that they don't bend over time. Another bonus is that they are wipe clean, so you know that they won't be destroyed after a few grubby hands. We also noticed that the illustrations are very clear, and it is obvious what each character is. This meant that Elise wasn't confused and could recognise all of the cards. There are 24 cards in the pack. This makes up 12 pairs of animals and characters. Your child can either play alone, or you can play with up to 4 players if they are a bit older. The game that we played with Elise was to spread the cards face up on the table, and then we helped her to match up the different heads and tails of the cards. We encouraged her to make the sound of each friend that she matched. Although the first time we played, we ended up matching the cards and she just made the noises! 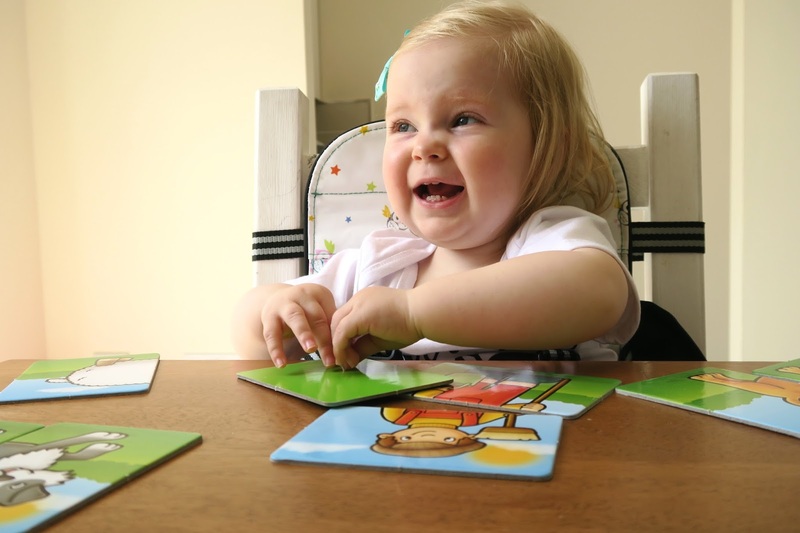 As your child gets older, you can start to turn the cards upside down to the blank green sides. You can introduce matching. This will also help them to learn how to take turns, and let them work on their counting skills as they add up how many characters they have matched. 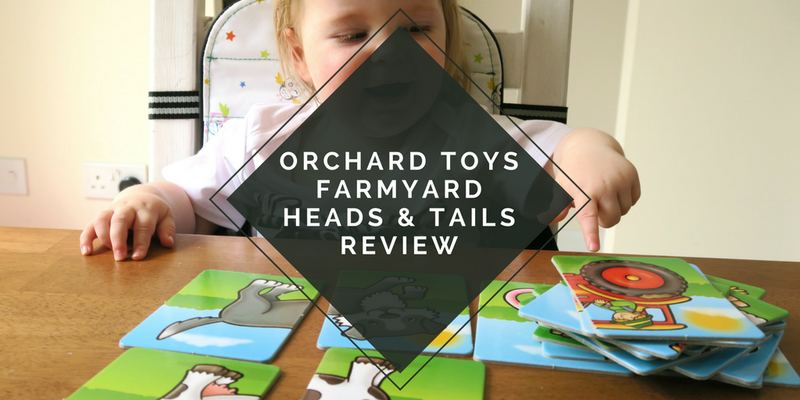 The Orchard Toys Farmyard Heads & Tails game helps to develop a range of skills. It is carefully designed to help develop your child's memory skills, as well as encouraging their observational skills. We also found that it helped to promote discussion. 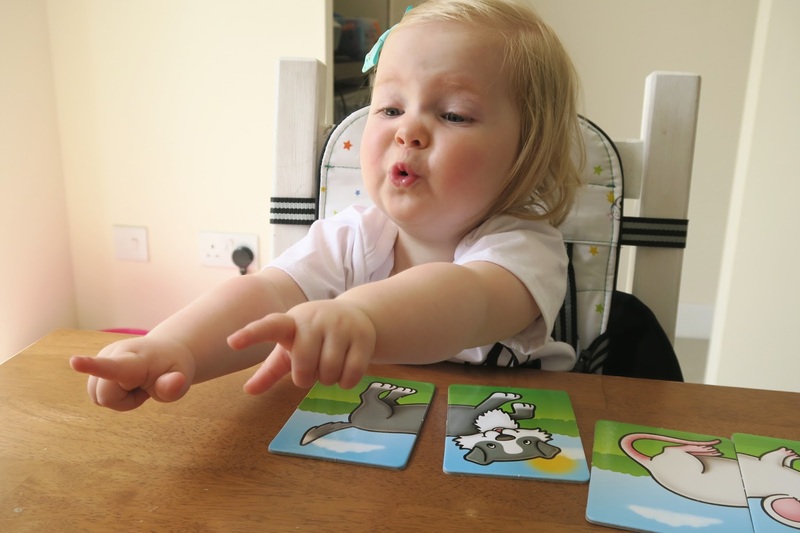 Elise is at a great age for learning new words and interactions at the moment, so we found we could ask questions about the cards, and she could reply. Another thing that we noticed is that the more times we play the game, the better Elise's hand eye coordination is. At first she didn't really match the cards, but as you can see, she soon started to match them up. This happened on the second time of playing. She couldn't quite match them up completely, and sometimes they were the wrong way round, or not aligned. However, the third time we played she was mostly matching them up perfectly, and could pick the animals out of a stack. She also loves it if we hide the cards around the room. We also took it in turns to match cards, and she soon grasped this concept. She pointed at us when it was our turn, so this game is great for developing social skills too. We think that this game is amazing. It gets two enthusiastic thumbs up from Elise too. We've had the game for just over a month and Elise has wanted to play it nearly every day. We even have to hide it away so she doesn't ask to play constantly! She loves to play with us, but also enjoys playing with it by herself. Yes she thinks the farmer is a train driver, but she is a little obsessed with trains at the moment, so that is understandable! I've tried to think of a negative point, but I don't think there is one. I think my only negative point to add is that I wish there were even more cards in the box! 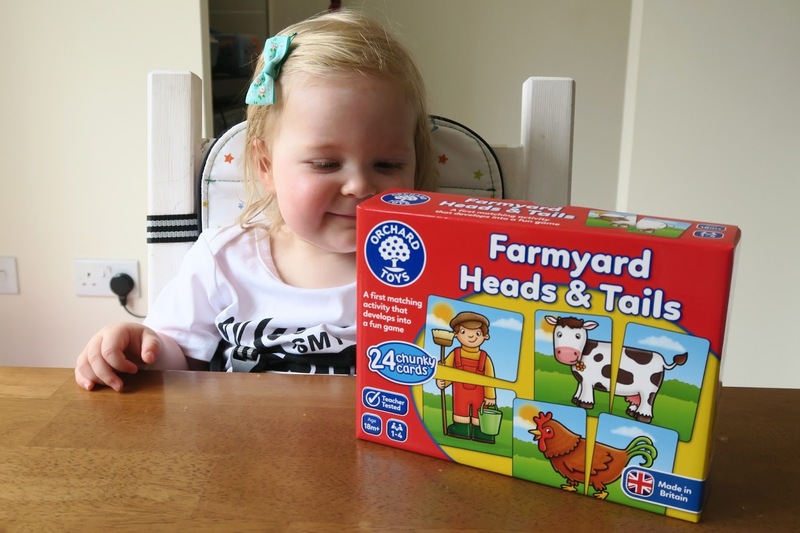 The Farmyard Heads & Tails game retails for £7.50 and can be purchased on the Orchard Toys website under Games. You can also purchase from toy shops all across the UK. I WAS SENT THE FARMYARD HEADS & TAILS GAME FOR REVIEW PURPOSES. SOME POSTS MAY CONTAIN AFFILIATE LINKS, WHERE I RECEIVE A SMALL AMOUNT OF COMMISSION IF SOMETHING IS PURCHASED THROUGH THE LINK. THIS DOESN'T AFFECT THE END PRICE OF THE PRODUCT. BY PURCHASING THROUGH MY LINKS, YOU WILL BE HELPING ME TO KEEP THIS BLOG RUNNING SO THAT I CAN BRING YOU AWESOME CONTENT. FOR MORE INFORMATION, PLEASE READ MY DISCLOSURE POLICY.